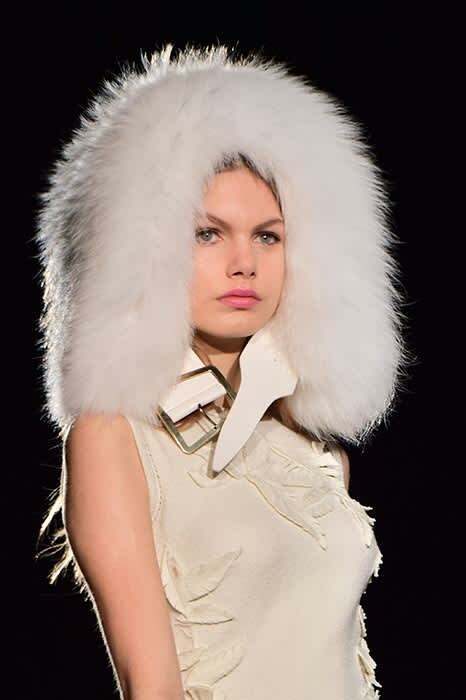 HFM at Milan Fashion Week: Day 4 | HELLO! 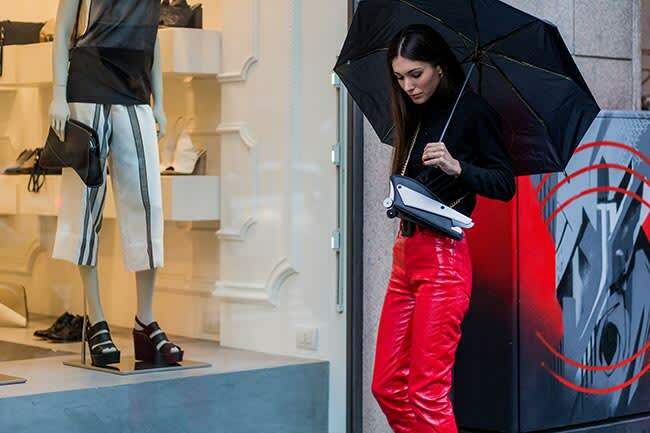 Constant rain poured a bit of a dampner on Saturday at Milan Fashion Week. The crowds of 'camera-phone-fans' outside every show venue were joined by opportunistic 'umbrello' sellers, and fashionistas sheltered under brollies held aloft by their drivers. I made do with my Topshop pom-pom beanie! 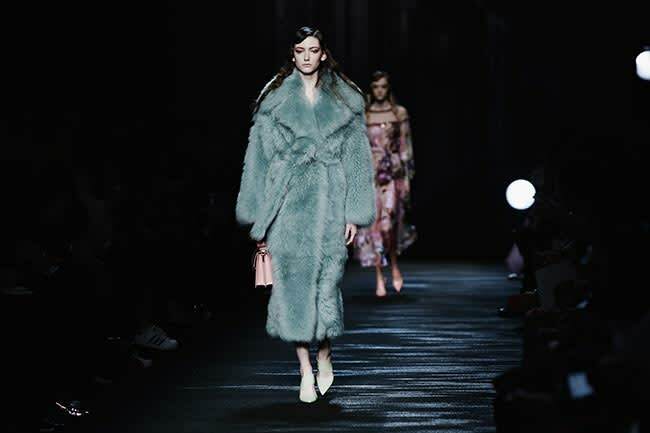 The weather, fairly typical for Milan's winter months, made it seem highly unlikely that a pair of fur flip-flops (as seen on the Blumarine catwalk) would ever be a footwear option for January. On the catwalk, the mood was 'Moonlit Nocturne', a fairly loose description which encompassed everything from pastel furs (and those flip-flops) to sheer and black lace panelled red carpet dresses. 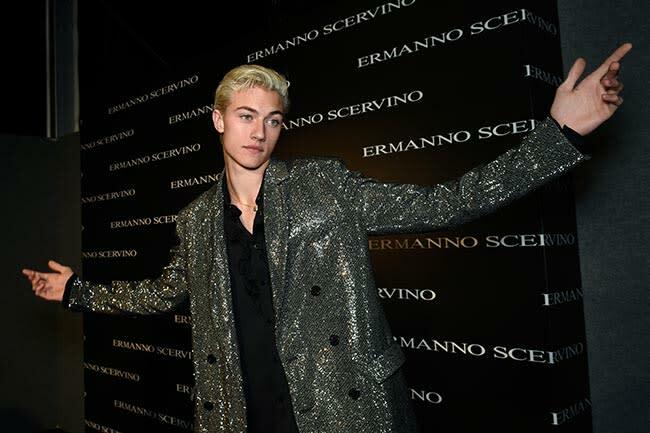 There was a pap frenzy over at Ermanno Scervino, where the pink-haired American model, Pyper America, breezed down the runway in tiers of beige lace, and was escorted away post show by brother Lucky Blue Smith. Scervino showed some expertly cut military jackets, trimmed with frogging and featuring wide, cape-like collars, and declared next season’s must-have to be a fox helmet. We managed to squeeze in a quick visit to Angela Missoni's studio where she was putting the finishing touches to the collection she'll show tonight. The designer told us she was very happy with everything - and the colours, patterns and textures of the outfits hanging on the rails, all numbered and ready for the models, convinced us this was going to be a shining moment for Missoni. Last stop of the day was at Aquilano Rimondi, where we chatted backstage with designers Tommaso Aquilano and Roberto Rimondi and met their gorgeous four-year-old white poodle Ugo. Who is a bit of a fashion fanatic. He certainly matched the collection, which was an exercise in meticulous cutting, featuring contoured dresses and coats, stitched in panels to outline the body, in either icy white or jet back, with the occasional flash of silver and red. Today, we're off to see Stella Jean, Dolce & Gabbana, and Bally, among others - watch this space.